Evasi0n is the latest tool for jailbreaking your iPhone, iPod touch, iPad, and iPad mini device running iOS 6.0, 6.1.0, and 6.1.2. The evasi0n utility app can be downloaded for free and runs on Windows, Mac OS X, and Linux computers and will then easily jailbreak your Apple mobile device. Evasi0n was developed by the evad3rs hacking team which consist of @pimskeks @planetbeing @pod2g and @MuscleNerd. After you have used evasi0n and installed Cydia, you will get updates sent to your devices via Cydia. The latest version of evasi0n is 1.4 which supports the latest iOS 6.1.2 software update. Read below for quick download links and installation instructions. To be safe, first backup your device using iTunes (or iCloud) before using evasi0n. This will give you the peace of mind of being able to go back to your current state if you change your mind down the line or if something goes wrong and you get stuck. 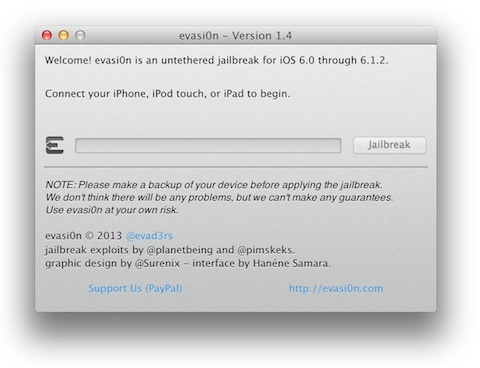 Run the evasi0n application on your computer and click on the “jailbreak” button to start the process. Once evasi0n is finished jailbreaking your device, your device will restart and the Cydia icon will appear on your HomeScreen. Jailbreak Notes and Tips: While evasi0n is running ignore iTunes messages and iOS alerts. You are even probably better off walking away from your computer for a few minutes. If for some reason something gets stuck somewhere just restart the evasi0n program or restart your device by pressing and holding down the power and home buttons simultaneously. Users of OS X 10.8 may have problems opening the evasi0n app. To get around this just control-click (right-click) the app icon and choose “open” a couple of times. AppSafari review of evasi0n was written by Darius Reimm on February 19th, 2013 and categorized under Cydia Apps. Page viewed 14709 times, 6 so far today. Need help on using these apps? Please read the Help Page. Love Cydia IT is a BEAST!!!! !